Luina Greine Farm is proud to be associated with NEAFP and offers many NEAFP products in our shop and online store. We also offer products through Peruvian Link Co. in our shop and online store. All of the products listed below come from the New England Alpaca Fiber Pool (NEAFP). This is where Luina Greine Farm sends all of the fiber that it harvests from its herd of alpacas. The New England Alpaca Fiber Pool is located in Fall River, MA and was founded in 1997 by three fiber artists who dreamed of sharing the wonders of Alpaca Fiber with everyone in North America. Luckily, New England was densely populated with century old textile mills in desperate need of a niche market to keep them in operation. With the help and commitment of many talented Alpaca Farms, Fiber Artists and Mill Owners, NEAFP’s dream has grown into a flourishing business. U.S. mills were eager to work with small quantities of Alpaca Fiber and invest in the future of alpacas although they wanted some type of commitment that their hard work would not be shipped overseas once alpaca product demand started to accelerate. As a practical matter, NEAFP adopted a policy to only produce U.S. made Alpaca Products using only Alpaca Fiber harvested in the U.S. and as it turned out, this was enough of an incentive for U.S. manufactures to work with them. Their manufacturing partners are century old businesses, employing generations of families throughout their communities. It is interesting to experience how U.S. textile mills have re-invented themselves and truly come full circle. What NEAFP sees is people working together and doing whatever it takes because they know the mill, and their jobs depend on it. Likewise, it is important for all alpaca farms to embrace the fiber aspect of their businesses for the industry to have longevity and sustainability. 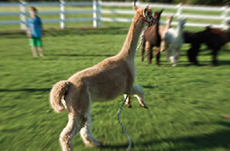 Peruvian Link Co. was established in 1997 to bring to you one of the world’s finest fibers, Alpaca. Alpaca is used to make many of our gorgeous high-quality Alpaca garments and accessories. Peruvian Link Co. works with ethical and ecological Peruvian Producers who are fairly compensated for their technical abilities. Our mission at Peruvian Link is to help these artisans to be recognized for their talents and abilities, and to serve as a venue for their economic development as well as to offer a variety of high end apparel and accessories. Peruvian Link Co. gets involved in the production of more than 80% of the products available on their line, from choosing and purchasing the fiber to designing and manufacturing the different garments and accessories. Peruvian Link Co. realizes that many artificial fibers are available and some of them being sold as Alpaca. The only way to ensure the highest quality was to get involved in production. Peruvian Link Co. employs over one hundred people in Peru in more than 20 different groups from artisans to tailors and handknitters, each of them specializing in what they do best. Luina Greine Farm is proud to sell items from Peruvian Link.